Everything Chris Benoit did in the ring was fluid and perfect, from his earth-shattering clotheslines, deadly German suplexes and poetic diving headbutt. Easily one of the best professional wrestlers to ever grace the ring, his legacy will unfortunately always be tarnished after he brutally killed himself, his young son and wife in their Atlanta home on June 24, 2007. Already on its heels and trying to increase struggling viewership, Benoit’s death put a scar on the industry that it has yet to recover from, one that shows that many of these athletes are left to their own devices, regardless of how many problems they have, as long as they continue to draw money. While it’s nearly impossible to find out what was truly going on in Benoit’s mind the day he committed those savage acts, “Benoit,” a book comprised of five essays by four wrestling writers, Steven Johnson, Heath McCoy, Irvin Mushnick and Greg Oliver, attempt to dissect the situation as the four not only share their thoughts on the former superstar, but the current state of the business. 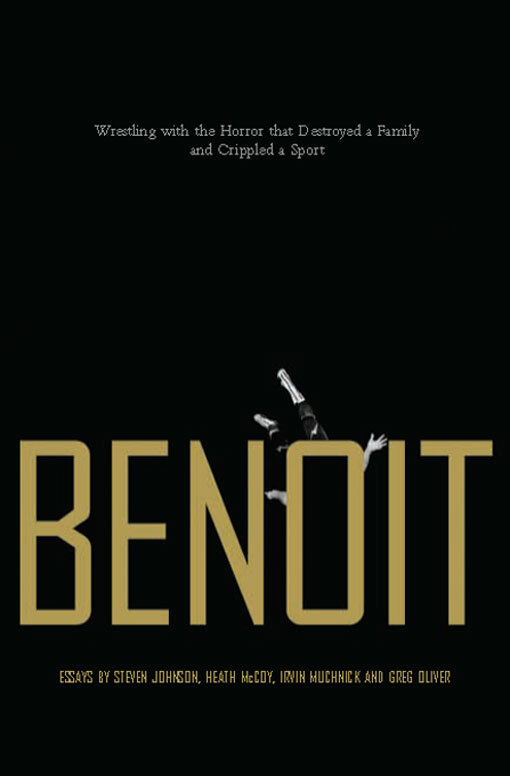 The end result is a book that sheds a bit of light on Benoit as a person, as all of these writers have great sources and even connections to the man. It also focuses on how the media ate up the death and tried to use it to their advantage while the WWE was forced to erase him from their record books and continue on without him like nothing ever happened. When it’s all said and done, in spite of some scene-setting that the dedicated fan could go without, there’s more than enough new information here for someone who loves the “sport” to get something out of it. While Oliver’s first two essays in the book do more scene-setting than anything else, they prove to be a good seg-way into the pieces written by McCoy, Johnson and Muchnick. Showing us how a runt from Edmonton become a star and let it all go to waste, the same way his wife ended up going from a spectator to a pivotal character in several memorable wrestling storylines, it’s obvious Oliver knows his stuff. He also knows Benoit, as he shares an e-mail between the two that shows Benoit was in deep despair after his best friend Eddy Guerrero’s death. Heath McCoy’s essay focuses more on Benoit’s start in the industry, showing essentially how he was the pride and joy of the Hart Family Wrestling Dynasty, as he was easily the best wrestler they ever produced. Hearing how timid he was throughout his early years makes you wonder how he could of just snapped, but McCoy shows us that even then their were warning signs that show Benoit had pent up aggression and a love for steroids that would signal later problems down the road. When we get down the road, Steven Johnson does an excellent job showing us how the mainstream media tried to take advantage of the tragedy, and in the process proved how little it actually knew about the business. While a bit dry at times, Johnson’s research and insight is incredibly valuable in the fact that he proves that the wrestling world is different from all other forms of entertainment and if the average journalist wishes to enter that world, it’s going to have to work hard and learn the ropes. Shrouded in mystery, stemming from its carnival beginnings, wrestling may be on the biggest scale it’s ever been, but that doesn’t mean it’s easy to understand. What is easy to understand however is Muchnick’s commentary on Benoit as a person and sources that show he was far from the upstanding citizen he claimed to be. Nevetheless, Muchnick doesn’t fault Benoit, he faults the business, for exploiting these athletes for decades and eventually asks the question: Is this fun anymore? The best essay in the book, Muchnick asks the questions the industry needs to answer and soon. You wouldn’t think that a book of short essays on a moment in professional wrestling would be compelling, but “Benoit” satisfies by having a near perfect blend of commentary, journalism and nostalgia. In the end, it’s a quick read that any serious wrestling fan should take a look at. Thanks for the info. Loved watching the Benoit/Angle technical technical fireworks matches, was shocked to learn of his death. Sounds like this book gives great context for his life, and explores the larger social context.